The goal for these negotiations is to reach a mutually-agreed long-term comprehensive solution that would ensure Iran’s nuclear program will be exclusively peaceful. Iran reaffirms that under no circumstances will Iran ever seek or develop any nuclear weapons. This comprehensive solution would build on these initial measures and result in a final step for a period to be agreed upon and the resolution of concerns. This comprehensive solution would enable Iran to fully enjoy its right to nuclear energy for peaceful purposes under the relevant articles of the NPT in conformity with its obligations therein. This comprehensive solution would involve a mutually defined enrichment program with practical limits and transparency measures to ensure the peaceful nature of the program. This comprehensive solution would constitute an integrated whole where nothing is agreed until everything is agreed. This comprehensive solution would involve a reciprocal, step-by-step process, and would produce the comprehensive lifting of all UN Security Council sanctions, as well as multilateral and national sanctions related to Iran’s nuclear program. From the existing uranium enriched to 20%, retain half as working stock of 20% oxide for fabrication of fuel for the TRR. Dilute the remaining 20% UF6 to no more than 5%. No reconversion line. Iran announces that it will not enrich uranium over 5% for the duration of the 6 months. 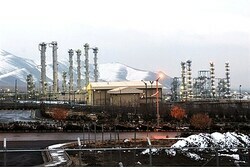 Iran announces that it will not make any further advances of its activities at the Natanz Fuel Enrichment Plant1, Fordow2, or the Arak reactor3, designated by the IAEA as IR-40. Beginning when the line for conversion of UF6 enriched up to 5% to UO2 is ready, Iran has decided to convert to oxide UF6 newly enriched up to 5% during the 6 month period, as provided in the operational schedule of the conversion plant declared to the IAEA. Iran will continue its safeguarded R&D practices, including its current enrichment R&D practices, which are not designed for accumulation of the enriched uranium. Submission of an updated DIQ for the reactor at Arak, designated by the IAEA as the IR-40, to the IAEA. – uranium mines and mills. Pause efforts to further reduce Iran’s crude oil sales, enabling Iran’s current customers to purchase their current average amounts of crude oil. Enable the repatriation of an agreed amount of revenue held abroad. For such oil sales, suspend the EU and U.S. sanctions on associated insurance and transportation services. Gold and precious metals, as well as sanctions on associated services. No new nuclear-related UN Security Council sanctions. No new EU nuclear-related sanctions. The U.S. Administration, acting consistent with the respective roles of the President and the Congress, will refrain from imposing new nuclear-related sanctions. Establish a financial channel to facilitate humanitarian trade for Iran’s domestic needs using Iranian oil revenues held abroad. Humanitarian trade would be defined as transactions involving food and agricultural products, medicine, medical devices, and medical expenses incurred abroad. This channel would involve specified foreign banks and non-designated Iranian banks to be defined when establishing the channel. direct tuition payments to universities and colleges for Iranian students studying abroad, up to an agreed amount for the six month period. Have a specified long-term duration to be agreed upon. Reflect the rights and obligations of parties to the NPT and IAEA Safeguards Agreements. Comprehensively lift UN Security Council, multilateral and national nuclear-related sanctions, including steps on access in areas of trade, technology, finance, and energy, on a schedule to be agreed upon. Involve a mutually defined enrichment program with mutually agreed parameters consistent with practical needs, with agreed limits on scope and level of enrichment activities, capacity, where it is carried out, and stocks of enriched uranium, for a period to be agreed upon. Include international civil nuclear cooperation, including among others, on acquiring modern light water power and research reactors and associated equipment, and the supply of modern nuclear fuel as well as agreed R&D practices. Namely, during the 6 months, Iran will not feed UF6 into the centrifuges installed but not enriching uranium. Not install additional centrifuges. Iran announces that during the first 6 months, it will replace existing centrifuges with centrifuges of the same type. At Fordow, no further enrichment over 5% at 4 cascades now enriching uranium, and not increase enrichment capacity. Not feed UF6 into the other 12 cascades, which would remain in a non-operative state. No interconnections between cascades. Iran announces that during the first 6 months, it will replace existing centrifuges with centrifuges of the same type. Iran announces on concerns related to the construction of the reactor at Arak that for 6 months it will not commission the reactor or transfer fuel or heavy water to the reactor site and will not test additional fuel or produce more fuel for the reactor or install remaining components. Consistent with its plans, Iran’s centrifuge production during the 6 months will be dedicated to replace damaged machines. “Sanctions on associated services” means any service, such as insurance, transportation, or financial, subject to the underlying U.S. or EU sanctions applicable, insofar as each service is related to the underlying sanction and required to facilitate the desired transactions. These services could involve any non-designated Iranian entities. Sanctions relief could involve any non-designated Iranian airlines as well as Iran Air.